Sherry, the least understood wine? Dwayne Perreault — Sherry has an image problem in the Netherlands. It's largely remembered as something grandma used to sip in the evening, or put in her trifle. Is it joining Madeira and Marsala, respectable fortified wines now largely denigrated to wines you cook with? Quality wines are meant to be drunk. It wasn't always this way. Historically, sherry was a popular drink in Holland. I worked for a while at Wijnkelder Brouwersgracht, an original cellar dating from the 17th century. Up until the 1980s, it was a storage and tasting place for sherries. But today, the average bottle of sherry in the Netherlands costs €5-7 and is bought in the supermarket. These wines do not represent the artisanal nature, the quality and diversity of styles that distinguish true sherry. 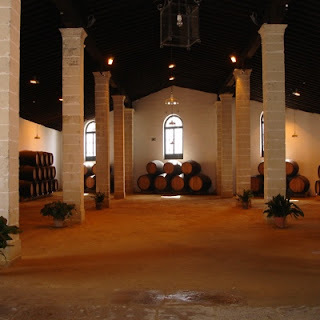 I was in Jerez recently, and had the opportunity to visit three bodegas. I will not spend time here discussing how sherry is made. What I want to illustrate is the amazing range of styles of wines, and their culinary possibilities. During tastings, my hosts were fond of suggesting food combinations, and it is my belief that if sherry will enjoy a renaissance in the Netherlands, then restaurants must lead the way! I first visited Bodegas Tradicion. This relatively young house was formed in 1998 yet only produces aged sherries. This is facilitated by buying in wines from other producers, an established practice in the industry. Two sacas (the process of drawing off of wines from each barrel) are performed traditionally by hand per year, leading to an annual production of about 13,000 bottles, half intended for the domestic market. In Jerez, aged sherries whose blend have a minimum average age of 20 years are designated VOS, or Very Old Sherry. Blends with a minimum average age of 30 years are designated VORS, or Very Old Rare Sherry. — Our tasting began with the VORS Amontillado, with an actual blend averaging 45 years. Sweet dried figs and prunes in the nose but the taste is dry, nutty with slightly smokey notes. This goes well with salty foods – jamon iberico, sardines, just use your imagination. — The VORS Oloroso has a more oxidised character, thicker and richer with some dark fruits. Recommended with meats, stews and pork roasts. — The VORS Palo Cortado, bright gold in its glass, has a finer nose containing caramel and dried fruits. More refined, lighter in the mouth with outspoken, salty bitters. A good accompaniment for shellfish, foie gras, soups and gazpacho. — The VOS Pedro Ximinez is lighter than most PX's, remarkable in that it has acidity with yet a soft texture and the typical dark raisins. Perfect with blue cheeses, reduction sauces, foie gras, beef dishes and yes, ice cream. Gonzalez Byass is famous the world over for Tio Pepe, the world's most commercially successful sherry. This is obviously a much bigger company, yet very much worth visiting, as nobody seems to understand better the importance of marketing sherry in this day and age. I might add that the wines were surprisingly good, and I was guided by the very knowledgeable Claire Henderson. A visit to any sherry bodega is like travelling back in time. The smell of oxidised wines permeates through the old butts into the building. At Gonzalez Byass, parts of the old bodega are a museum. — The Fino Tio Pepe has a pale gold colour, a brioche nose and is lively and light on the palate, dry with bitter almonds. Good with ham, white cheeses, seafood, paella and sushi. 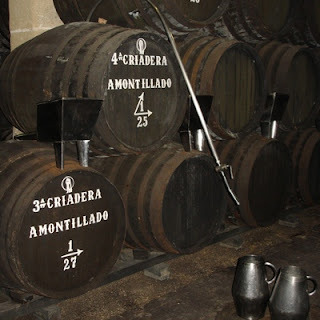 — The AB Amontillado Seco starts off as Tio Pepe, then is put through the solera. Lots of hazelnuts (characteristic of Palomino) in the nose and mouth, light oxidation with just a hint of sweetness (3 gm/l). Goes well with artichokes or curries. — The VORS Apostoles Palo Cortado – the only one in the world with PX (10%) – has the typical Amontillado characteristics, nutty but the PX gives it a hint of dates and figs. Silky in the mouth, good with foie gras and patés. 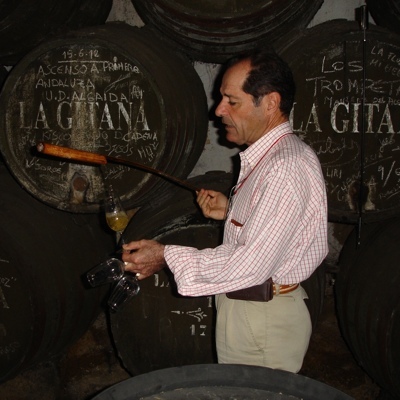 The next day I drove to the nearby seaside town Sanlucar de Barrameda to visit Bodegas Hidalgo la Gitana, where I was met by Javier Hidalgo, who drew samples straight from the barrel with his venencia. Finos that have been aged in Sanlucar benefit from a slightly cooler climate and seabreeze which allows flor to be active all year, and are called Manzanilla, currently the most popular style of sherry in Spain and exclusively produced in Sanlucar. — Hidalgo’s famous Manzanilla La Gitana is slightly salty yet fresh, with camomile and almond bitters. Many seafood matches, from cod to calamares to pulpo. — The Manzanilla Pasada is a rare style, mostly exported to the UK and USA. More smokey in the nose, with a lot more hazelnut in the taste. — The VORS Amontillado Viejo has a very rich caramel aroma and is delicious, fresher and lighter than others I've tried. A wonderful aperitif, if you ask me. — Finally, the VORS Palo Cortado Viejo is sublime, smooth and actually fresh in the mouth, one of the most amazing sherries I have tasted. According to Javier Hidalgo, this bottle would cost about €55 in London, "but this is nothing. These wines have been oak aged for 15 or more years. Each old cask, empty, costs €1000. New casks are cheap." He continued to illustrate the challenge sherry producers have always had to face, though he spoke while laughing: "Imagine you have a car factory and you produce 300 cars per year. But you can only sell 100 per year, and must wait 3 years before you can sell the other 200. What kind of business is that?" It’s the kind of business that keeps sherry lovers smiling. But more people need to discover what Manuel Gonzalez Gordon called "the Noble Wine".